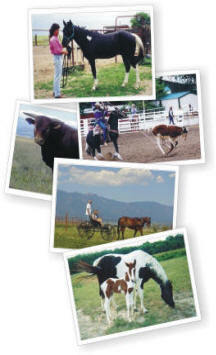 We specialize in breeding quality PAINT horses. We raise horses that look good and ride well, while maintaining a gentle disposition and willing attitude. Breeding for horses that can be ridden and enjoyed by beginner and advanced riders. So, mosey around and take a peek at what we're doin' here at the ranch. Please, remember that almost everything is for sale, so if you see something you like, let us know. Most prices are negotiable, we accept PAYPAL, and payment plans are usually available. If you have any questions or comments, please don't hesitate to contact us. We hope you enjoy your visit and come back soon. If it seems like a childish thing to do, do it in remembrance that you are a child.